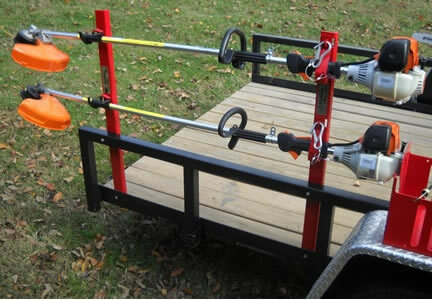 The TT-1 Trimmer Rack is perfect for semi-pros and small contractors who only need to carry two trimmers. 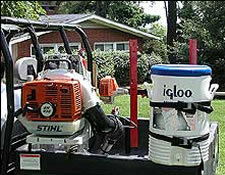 Also popular with larger contractors for carrying "stick edgers" or spare trimmers. 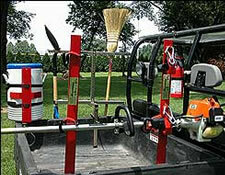 • Load or unload a trimmer in 3 seconds. • •3/16" all welded steel construction with a durable powder coat finish. • Locks trimmers individually with standard padlocks. 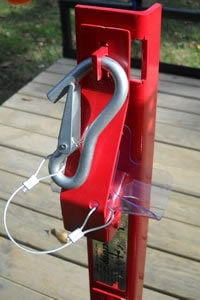 • Latch clips are secured to hinge with a lanyard to prevent loss. 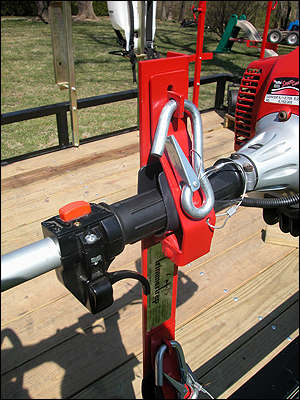 • Mounts to open or enclosed trailers (with MB-4 mounting brackets) quickly and easily. 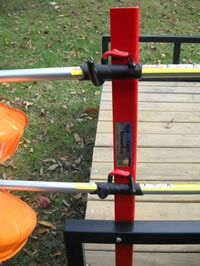 • Attaches to upper and lower rails of trailer creating much stronger mount than racks that attach to the top rail only. • Replaceable handle cradle protects and tightly holds trimmers in place. If you're not sure where to obtain our products, give us a call at (800) 279-8727 and we'll make sure you get your products quickly and easily. If you have a question or special request, just click here and fill out our short form detailing your question. We'll get back to you promptly. 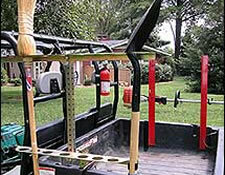 Place a round object that is about the same size as or a little larger than the trimmer handle into the racks cradle and push the racks hasp around the object causing it to bend slightly. 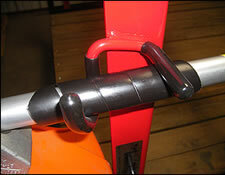 The trimmers handle should now fit without being loose. 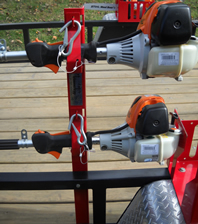 Included with your trimmer rack is a length of plastic spiral wrap (TT SW-1) which can be installed onto your trimmer shaft(s) to add additional protection where the shaft contacts the rubber cover on the racks hooks. 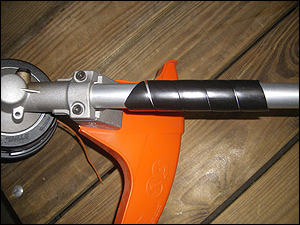 Cut the wrap into approximately 6” long pieces and wrap it around the shaft near the trimmer head where the shaft rest in the hook. See pictures below.